Abingdon (aka Abingdon-on-Thames) is a historic market town in Oxfordshire with the curious tradition of throwing buns from the roof of the County Hall Museum on specific days of celebration, most recently Elizabeth II’s Golden Jubilee. This tradition dates back over 250 years to 1761. I can’t quite make out why the buns have to be thrown but somehow the tradition started. 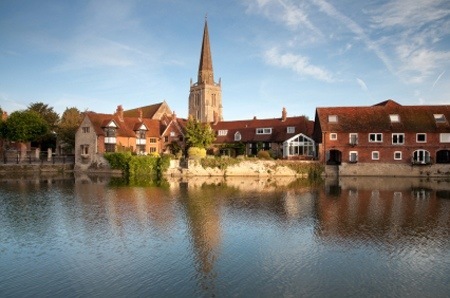 Abingdon sits on the River Thames and it is said to be one of Britain’s oldest continuously lived in towns with evidence of people having lived there 6000 years ago. It is certainly picturesque. together with many others of local scenes. In East St Helen Street there is the oldest, most complete medieval house which was built in 1431. The church in the distance is St Helen’s church first mentioned in the 10th century. 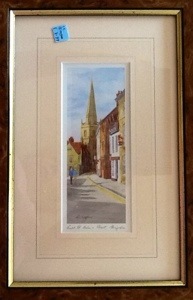 For all this history we paid a mere £3.99 and it is a lovely watercolour too. 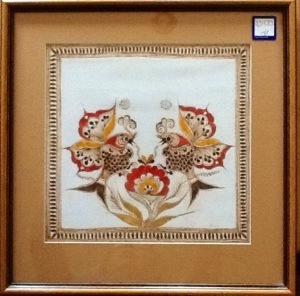 This next watercolour is by Gay Corran and is dated 1982. 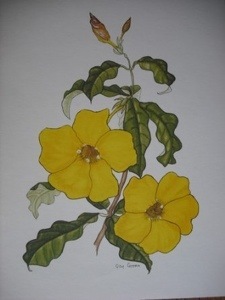 Here is an illustration from the book, which you must agree, pretty well matches the watercolour above. It seems Gay grew up in Hawaii but I think she lives in Devon now. Quite a few of her illustrations appear on various web sites, particularly in the US. Yes folks, Chipping Norton on the 17th August. What will they make of us there? be the same person that produced this? 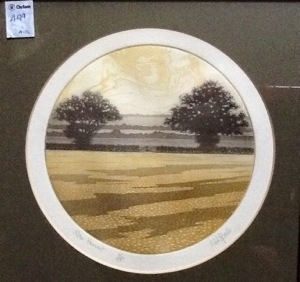 The bottom picture is a print signed by Mark Spain and entitled After Harvest 15/75. It cost me £4.99. It is a beautiful rural scene (not unlike the one from my own back garden) and could be anywhere in England after the harvest has been taken in and the evening shadows are lengthening. The colours are just right for the scene and on close inspection someone of considerable artistic skill has produced it. How many Mark Spains can there be? According to www.mark-spain.info/ a Mark Spain trained in graphics before setting up his own printmaking studio in Kent. From that clue, I do believe it could be one and the same and I think he has quite a following with his current work. 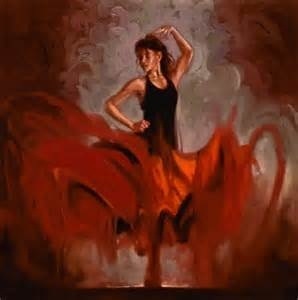 So, an early Mark Spain or just a Mark Spain? That is the conundrum. A red herring or something more meaningful? I had to open the back of this next painting in order to get a clue as to where it might be and what should I find but an Italian paper towel depicting a couple, lots of gold circles and the words (in Italian) ‘Today’s brides and grooms in Cambodia’. Well it did give me a clue as to the whereabouts of the scene in the painting (Italy) and there was some barely decipherable writing on the back of the actual painting which said ‘Laveno Intra Ferry 98 CF’. Laveno turns out to be a town on the shores of Lake Maggiore in North Western Italy. A car ferry links the town with Intra on the other side of the lake. So detective work done, here is the painting. 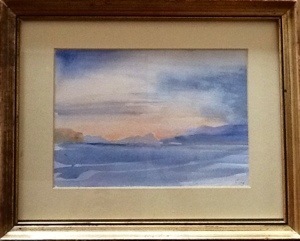 I have to admit that I find this watercolour to be a bit of a wishy washy view of the lake and the mountains at sunset but I do understand what the artist was trying to do. However a lot of sky and water can be difficult unless your name is Turner of course. 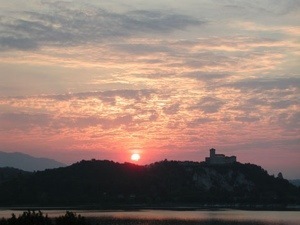 Here is a photo of Lake Maggiore at sunset. 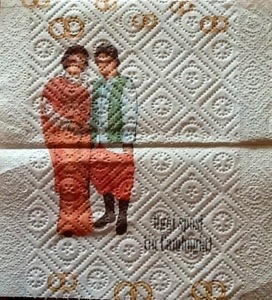 So, was the paper towel a red herring or a momento of a romantic journey? I guess we shall never know but it gave me something to write about! 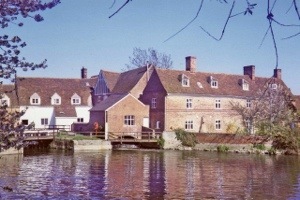 Flatford Mill is an 18th Century water mill in Suffolk. It was owned by John Conatable’s father and where the young John spent a “careless boyhood”. It was also the subject of many of Constable’s paintings including this one entitled ‘Flatford Mill (scene on a navigable river)’ 1816-17. Many, many people have followed in Constable’s footsteps including one Les Rivett from Bognor Regis. 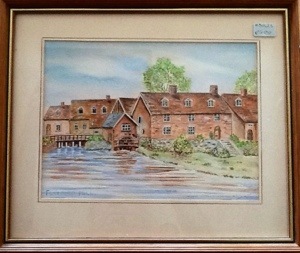 Here is his beautifully drawn and painted watercolour of Flatford Mill. 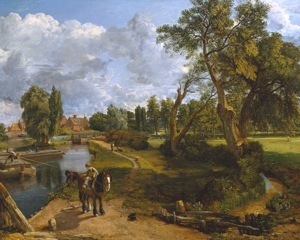 I fear Les has passed away now but he has left us, just as Constable did, this lovely painting. I bought it for £5 (considerably less than a Constable) and I hope it finds a good home soon. An evil omen or a symbol of wisdom? 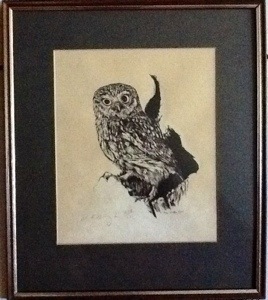 Which leads me nicely on to my next picture entitled The Little Owl. This is signed but the signature is illegible. 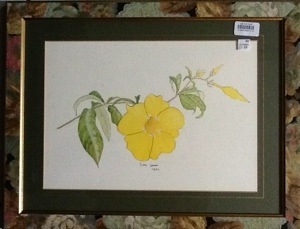 It is numbered 208/250 and it looks like a print of a pen and ink drawing. It is stunningly beautiful and clearly the artist was a master of his/her craft. I don’t think this little owl looks evil (or cross and frowning as some descriptions would have a Little Owl look). I think he looks rather startled and very handsome. Little Owls (Athene Noctua) were introduced to Britain in 1842. They are small and dumpy, grey/brown in colour and spotted with white. I think this one deserves a loving home, don’t you?